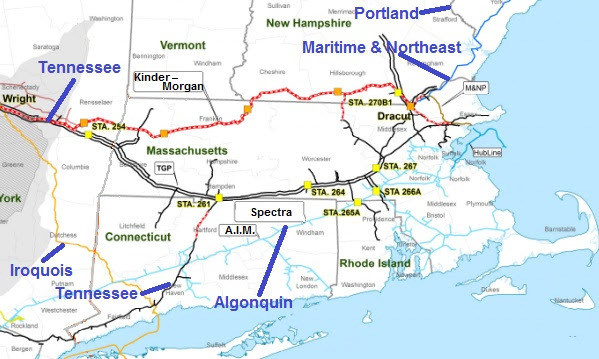 The New Hampshire Public Utilities Commission (PUC) took testimony on Thursday on the fracked natural gas storage facility and pipeline proposed for Lebanon and Hanover. Much of the focus during the three and a half hour hearing was on a “settlement agreement”, signed the previous week by Liberty Utilities, PUC staff and the New Hampshire Office of the Consumer Advocate (OCA), to which citizen intervenor Jonathan Chaffee, representing himself without an attorney, voiced strong opposition. None of the other parties to the review, the City of Lebanon, the Town of Hanover, and a second citizen intervenor, offered any support for the agreement. The settlement was negotiated during sessions that were closed to all but the three signing parties. It can be read here. 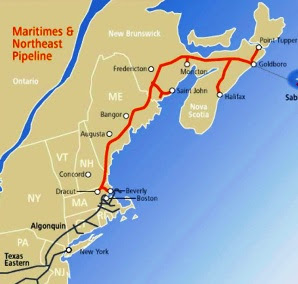 The agreement, if approved by the three-member PUC, would grant Liberty Utilities a monopoly franchise to distribute gas by pipeline in Lebanon and Hanover. Construction of each of the two initial phases of the system would not start until customer commitments for gas service reach a certain threshold of guaranteed revenue. However, under questioning by Commissioner Kathryn Bailey, PUC staff analyst Stephen Frink acknowledged in his testimony that, although his office would review the financial projections provided by Liberty once the company claims it has met the revenue threshold, nothing in the agreement would prevent Liberty from building the system if the analysis were to be found insufficient. So far, the company has announced no commitments in the form of contracts from large potential customers. Chaffee, who is the former director of the Lebanon Housing Authority, provided powerful testimony against the proposed pipeline and the settlement agreement. He offered evidence in the form of peer-reviewed scholarly research that natural gas, and especially fracked gas, has a greater climate changing greenhouse impact than any of the fuels that it would replace in Lebanon or Hanover, refuting Liberty’s assertion that natural gas is environmentally friendly. Using a spreadsheet “calculator” provided by Liberty Utilities, he demonstrated that virtually all households in the two communities that are currently heated with oil would pay more to heat with gas, a point that was eventually conceded by the company. Chaffee illustrated for the Commission that the US Energy Information Agency, whose forecast Liberty Utilities cited to support its contention to prospective customers that gas prices will remain low long into the future, actually projects steep price increases. He concluded his testimony by asking the commission to deny the company’s request for a franchise. The Town of Hanover was represented at Thursday’s hearing by Town Manager Julia Griffin, who testified about the town’s commitment to renewable sources of energy. She spoke about the disinterest of Dartmouth College in natural gas as an energy source and reported that she had had discussions with a Dartmouth Hitchcock Medical Center adnistrator and had been told that the hospital had recently signed a three year contract with a different energy supplier. The City of Lebanon was represented by city councilor Clifton Below, a former PUC commissioner and former state senator. In his closing statement to the commission, Below told the Commission that the City’s Master Plan does not support the expanded use of natural gas and instead calls for a shift from fossil fuels to renewable energy and greater energy efficiency. He also said the City would prefer that Liberty Utilities work with the City to achieve its goals to deeply reduce greenhouse gas emissions by accelerating the development of local renewables and beneficial electrification of transportation and heating, rather than continue to pursue this natural gas distribution franchise. Below pointed out that one of the factors that the Commission has said it uses to determine whether the granting of such franchises would be for the public good is whether the proposal is consistent with the orderly development of the region. The lawyer for Liberty Utilities, Michael Sheehan, objected to Below’s request on behalf of the City that the board issue a final order that includes a review in the form of a hearing once Liberty makes a claim of reaching sufficient customer commitments to pay for its system. 24 residents of the Upper Valley made the drive to Concord to attend the hearing. Eight of them, including state representative Lee Oxenham of Plainfield and Cornish, made oral comments at the start of the hearing, with concerns about climate chaos being a common theme. Several people connected the recent extreme weather disasters, including Hurricane Harvey, to the use of fossil fuels.